Two people have sued a California-based trucking company whose semitrailer crashed into a commercial bus on a New Mexico interstate, killing eight and injuring numerous others. An Albuquerque law firm filed separate lawsuits on behalf of two bus passengers. They weren’t named in the claims, but one is from Arizona, and the other is from Ohio. Attorney Bryan Williams said there are concerns about proper maintenance and inspection of a tire. Authorities say “tire failure” sent the semitruck careening across the median and crashing head-on into the Greyhound bus. The complaints alleged negligence on behalf of the unnamed truck driver and JAG Transportation Inc. They include a recent safety report from the Federal Motor Carrier Safety Administration that shows the company has reported three crashes in the last 24 months. A woman who answered the phone at the company’s office Friday said no one was available to comment. New Mexico authorities are commending motorists who stopped to help passengers on a Greyhound bus after a crash that killed eight people. State Police Chief Pete Kassetas on Friday called those who stopped “heroes.” He says they helped dozens of passengers get off the bus before authorities arrived Thursday at the crash on a highway near the Arizona line. Kassetas says “tire failure” led an 80,000-pound semitruck owned by JAG Transportation Inc. in Fresno, California, to crash head-on with the bus carrying 49 passengers. A 35-year-old truck driver was behind the wheel. He says the eastbound truck crossed a dirt median without the wire barriers that sometimes separate highway lanes before striking the bus. Kassetas says the wires likely wouldn’t have stopped the truck, given its weight. 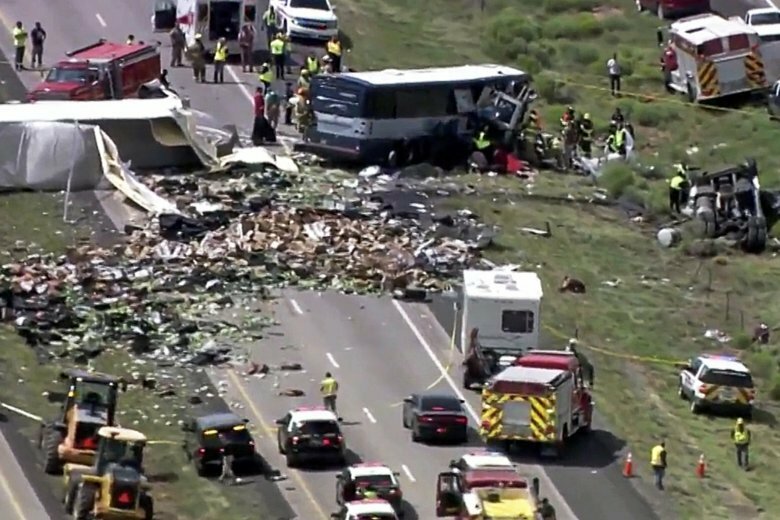 Medical investigators have confirmed there are now eight fatalities from a crash involving a semi-truck and commercial passenger bus on a New Mexico interstate. The New Mexico Office of the Medical Investigator said Friday that seven bodies were recovered from the scene and that another injured person who was taken to a hospital for treatment died. New Mexico State Police they are working to identify the victims and trying to track their relatives. Many others were injured in Thursday’s crash on Interstate 40, about 100 miles (160 kilometers) west of Albuquerque. Greyhound bus officials have said 49 passengers were aboard the bus. Hospitals in Albuquerque and Gallup were still treating injured patients, with some in critical condition. The front of the bus was mangled and the semi-truck flipped with its tractor-trailer on its side and its cargo strewn across the road. Officials said transportation workers will be cleaning up the debris Friday. The American Red Cross is sending volunteers from Albuquerque and Phoenix to western New Mexico to help victims of a deadly head-on bus crash. The group announced Friday that volunteers will assist because there were many people injured and that the volunteers will provide food, water and support to victims, emergency workers and officials. Authorities say a blown tire on a semi-truck may be to blame for a deadly head-on crash Thursday with a commercial passenger bus along Interstate 40 in New Mexico near the Arizona border. At least seven people were killed in the crash and many of the 49 passengers on the Greyhound bus were injured. The crash happened around 100 miles (161 kilometers) west of Albuquerque. A blown tire on a semi-truck may be to blame for a deadly head-on crash with a commercial passenger bus along Interstate 40 in New Mexico near the Arizona border, according to authorities. At least seven people were killed in the crash and many of the 49 passengers aboard the Greyhound bus were injured although authorities couldn’t immediately provide an exact count of how many were hurt or their conditions.